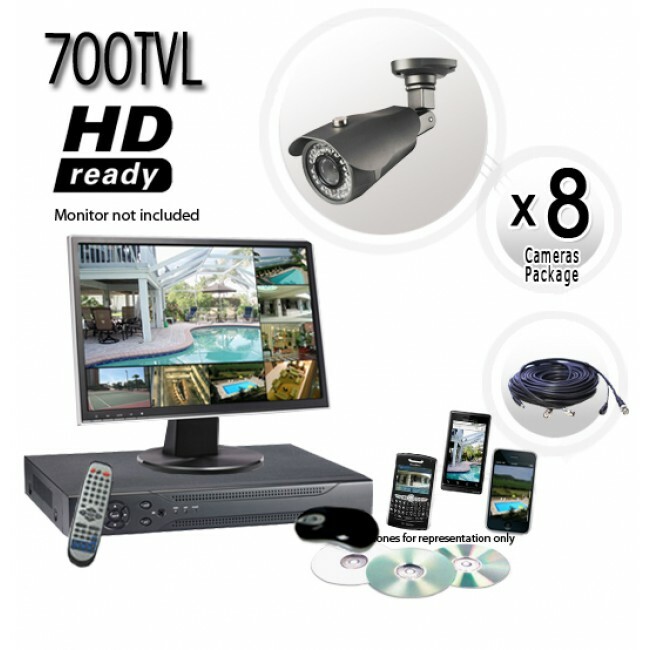 This system comes with 8 of our 130ft infrared 700TV Line Resolution Cameras with manual zoom lens, and a 8 channel H.264 DVR with 500gb Hard Drive. This is a high quality security system that is plug and play ready. Ease of use is streamlined with a huge variety of features to make this a very attractive surveillance system solution. This high resolution 700TVL Surveillance Camera System will outshine any other camera systems you can find in this price range. On the DVR end of this camera system, you’ll find a brand new high resolution DVR that truly exceeds expectations of today’s DVR units. Featuring a brand new user interface, this DVR delivers easy to use menus, and it’s amazing timeline video search feature. No more confusing searching through hours of video footage. With this new timeline feature, you can easily pinpoint events quickly. This DVR comes with a 500GB Hard Drive pre installed and formatted for your convenience allowing for about 3 weeks of continuous recording for all eight cameras. Motion detection is another important feature on this DVR. It features sensitivity options, scheduling, and even motion-masking if you have an area that is triggering your motion too often. On top of motion scheduling, you can schedule this DVR to manually record all the time when you need it to. This DVR also features remote viewing not only from a PC or MAC, but from most Smartphones as well. Now also supports iPad remote viewing. On the Camera side of this system, you will not be disappointed. These are the best of the best with a resolution of 700TVL! You will not find a camera with a higher resolution. The DVR and Cameras complement each other in the astounding resolutions they are capable of. These are very high quality cameras made of metal with a Sony Effio-E image sensors. When installing these cameras, remember that they have a varifocal 2.8-12mm lens for the perfect angle. The night vision on these cameras is an incredible 130ft with 60ft of facial capture distance and up to 130 feet for larger objects. They will withstand the harshness of weather no problem. These are very versatile and work well in an indoor or outdoor environment. 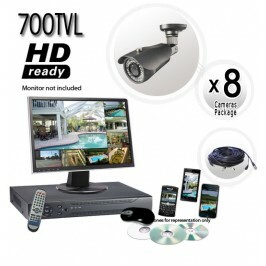 8 Camera Security System, 700 TVL Resolution, 130ft Night Vision 0 out of 1 5 based on ratings. user reviews.